Most of us just accept the 'normal behavior' of a place as something that's handed to us. We have to deal with it. But that's not true, as Grant McCracken has demonstrated. The challenge is having the ingenuity and patience to make changes. As Alex Bentley, Mark Earls, and Michael O'Brien have recently pointed out, we are profoundly social creatures who absorb and imitate the behaviors of others — often without thinking about it much. This is the way fashion works. Before we know it, and without making a conscious decision, we find ourselves wearing fuchsia or buying Capri pants. We are hard pressed to explain ourselves, because this social change worked by an invisible logic and in tiny increments. If in Houston, you're invited to join me at a $10 workshop called Next-Level Networking on Saturday, June 30 from 9 to 11 a.m. Connecting with other people at a gathering is usually challenging for all of us, and my friend Durwin Sharp has developed an approach and a tool that helps us get more and enjoy it more. We'll listen to Durwin for a half-hour or so, then rotate through pairs chatting about the things that really matter to us. The net result is that we have deeper connections and more information that we can use. You'll leave with a little booklet where everything is written down. There'll be coffee and breakfast snacks. The location is the party room of my condo at 1400 Hermann, in the Museum District in Houston. You can RSVP to me at Theresa@QViews.com and I'll send directions and parking advice. You can pay the $10 by cash or check at the door. Our sponsor is the Houston chapter of the American Advertising Federation, www.aaf-houston.org. They do a great job of helping us stay connected. When I read the article below, I remembered how difficult it has been for me to participate in conferences. At GEL one year I had dinner with a really interesting guy but we were both out of cards, and I can't remember his name. I can remember odd details, things about him that were unique--the way he took care of his girlfriend's cat. I wish I had kept up with the connection because I know he was very trustworthy. The networking tool that we'll provide at the workshop helps you maintain these connections much better than an exchange of business cards. The method we use cuts through the B.S. and meaningless chit-chat. Join us and find out more about yourself as well as all the people who'd support you if they only knew how! It took some getting used to, especially at a conference where we tend to define ourselves by our roles and people talk to each other while looking around to see if there's someone more useful to talk to. But it's a mistake to launch in to your business plan when you meet someone new — even at a conference where the point is to peddle your business plan. People invest in you first, then your plan. So show them you first, then your plan. That's precisely why shedding our roles — at least initially — even at a conference and even if there is something we want from others, is such a good idea. People will trust you if you trust yourself. And to trust yourself you have to step out from behind the curtain. You have to expose yourself, free of titles and status. When you allow people to see you — as impressive and vulnerable as you are — then they will trust you. Because they will know you. More and more evidence is piling up that in order to change things you have to hang out with the right people. Creativity is often associated with the singular, with a single person at his desk or talking a walk. It’s actually much more social. We often associate entrepreneurship with one person — it’s Steve Jobs, it’s Richard Branson, it’s Oprah Winfrey — when actually part of their creativity is who their friends are. The same is true for genius like William Shakespeare or Plato. They arrived in clusters; they weren’t alone. William Shakespeare lived in the same city at the same time with Francis Bacon, Christopher Marlowe and John Dunne. That’s not an accident. Alexandra Samuel argues that once we embrace our online lives as part of our real lives we will unlock the potential of the internet. She is the Director of the Social + Interactive Media Centre at Emily Carr University, and the co-founder and principal of Social Signal. I love it when you scanning your twitter account and click on an article and have your mind blown. I'll never think about my camera phone the same way again. I've quoted the most jarring part of the article below, but I recommend you read the entire piece. He sees filters as a natural way that we try to soften the blow of reality. The truth just might be that we can't handle the truth -- the digital "truth," at least. We've somehow been convinced by companies such as Canon and Nikon -- to cite two photography conglomerates that have successfully transitioned their product lines from analog to digital -- that megapixels don't lie. That higher resolution is somehow truer to life. But the reality is that digital is just another type of simulacra -- endless streams of 1's and 0's that offer an antiseptic, and often brutal, take on reality. Digital is unforgiving in a way that the human eye isn't. A 20-megapixel camera can detect -- and bring into jarring relief -- the laugh lines around even a 20-year-old's mouth. All of which makes me think of a famous Susan Sontag observation from her collection of essays titled "On Photography": "To photograph people is to violate them, by seeing them as they never see themselves, by having knowledge of them that they can never have; it turns people into objects that can be symbolically possessed. Just as a camera is a sublimation of the gun, to photograph someone is a subliminal murder -- a soft murder, appropriate to a sad, frightened time." "On Photography" was published in 1977. In the 35 years since then, photography has only gotten more brutal, more murderous. We're all armed and dangerous now. In order to get back into the swing of blogging, I'm going to concentrate on sharing things I love. Today, I'm sharing an excerpt from his review of Ricky Armenariz at the Art League. The key in criticism is to say something as interesting as the artist did, but make it fit with the work in a complementary way, even if it's not a compliment. Robert nails it. And I agree with Ricky... I want more and more. 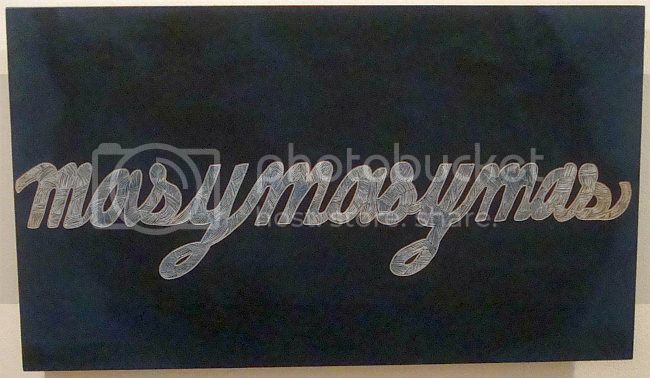 Ricky Armendariz, masymasymas, 2010, oil on carved birch plywood, 14" x 24"
But his overarching subject seems to be dangerous desire--wanting more and more, as masymasymas implies. Bad love affairs, drugs, money--all of these fit into that burning need for more. Ricky Armendariz depicts a world where things get bad, but they never get boring. I'm surprised how many things I expect will continue to frustrate me eventually become ordinary, not worth noticing. I wonder if I am changing, drifting into a different set of behaviors. I have to push myself to notice. Our brains are remarkably good at cancelling out all sorts of constants in our everyday lives. The brain is interested in changes that it needs to react or respond to, and so brain cells are charged with looking for any of these differences, no matter how minute. This makes it a waste of time registering things that are not changing, like the sensation of clothes or a chair against your body, so the brain uses adaptation to tune this background out, allowing you to focus on what is new.